This is a sample entry from Tom Dosdall’s email newsletter, Dosdall Daily Edge, published on August 30, 2012. I expect to see the stock market open lower this morning. This might put some downward pressure on the Cocoa market, which has made fresh 9-month highs the last two trading sessions. 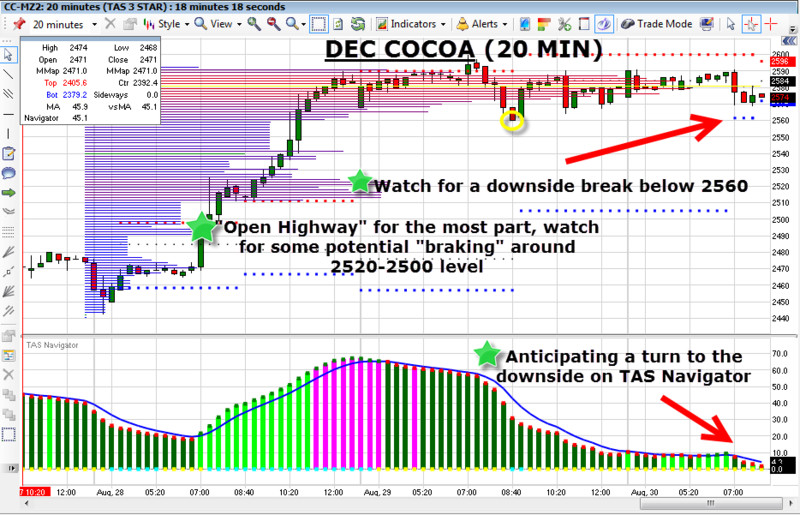 For those reasons, and the potential “3 STAR” setup with TAS Tools, I like the downside on a break below 2560 (and a flip to bright red on Navigator). If filled, consider a stop loss above “city traffic” at 2600.